OK. If you passed Wine 101 and know the basics of wine tasting, holding your glass by the stem, swishing, swirling and spitting occasionally...it's now time to get the best taste out of every glass of wine. You simply need to serve your wine at the proper temperature. If you serve Chardonnay straight out of the frig, it is way to cold. If you live in Phoenix and serve your Cabernet Sauvignon at room temperature your wine is too warm. If you have a basement, that may be the coolest place to store your wines. Once a year, we produce the Grand Vintners Fundraiser Dinner, which is undoubtedly the highest profile event at the annual Denver International Wine Festival. 100% of the net proceeds all revenue generated from this evening will benefit the John S Davies Scholarship Endowment Fund. The scholarship is dedicated to the memory of my Father who was a talented Chef and Hospitality Manager. Dad died tragically at the age of 26 as the result of a car accident. 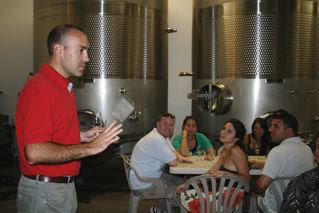 I was so pleased to host a tour of 37 wine lovers on Saturday. We departed from The Soho Grand Hotel at 8:30AM and picked up guests at Grand Central Station and Long Island. The morning was misty, but as we approached the North Fork things dried out. Our first stop was Macari Vineyards in Mattituck. This is one of my favorite wineries on Long Island. 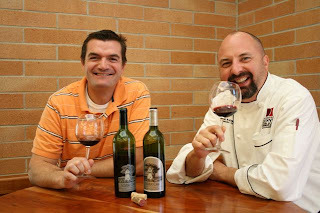 The Macari's are a great family that produce wonderful wines. Their wines have a great quality to price value. So unlike other LI wineries, I feel these wines compete competently amongst similar priced wines from domestic and international wineries. According to Joseph Macari SR, the proprietor, the 2008 Harvest was OK and not as fruitful as last year. We tasted Macari's new Early Chardonnay($16.99), which was made from grapes just picked this September 14th! The wine was crisp and had a powerful scent of ripe apples.